Bare root maidens, 50-100 cm. Most chestnut varieties require cross pollination for a good crop – use one of the pollinators listed in the table below. These varieties should start fruiting 2-4 years after planting. 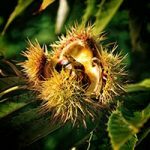 Marrons bear single nuts within the seeds, châtaignes bear multiple nuts in one seed separated by a papery inner shell. The hybrids are Japanese-European crosses made in France with resistance to ink disease and are heavier cropping. Our most highly recommended varieties are Belle Epine, Bouche de Betizac, Bournette, Marigoule, Marlhac and Precoce Migoule. For a single tree, plant Marigoule. We have seedling and grafted trees available, note that seedling trees will not be identical to the mother tree so there may be variation in the nut shape and size. The table below indicates pollinators. Early ripening is late Sept/early Oct in the South of the UK, late is late October. Northern areas should use early ripening selections.